It started as a bedroom – La Petite’s bedroom. Then she grew up. And moved out. And stayed moved out. We’re still crossing our fingers. Then we cleaned and de-cluttered and rearranged. At the present time, Amigo’s bean bag chairs sit on the bed out of reach of bunny teeth. 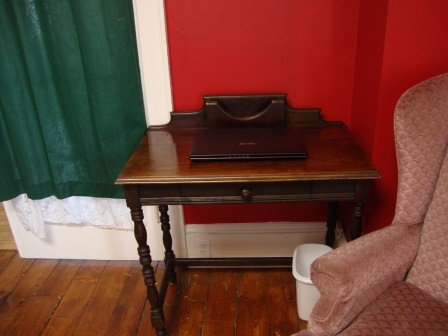 For my laptop, we found a new-to-me writing desk that’s perfect for a laptop like mine. Chuck found it at an antique mall and managed to bargain the price down a bit. It’s lovely, sturdy, and fits the character of the house nicely. Then we looked inside. 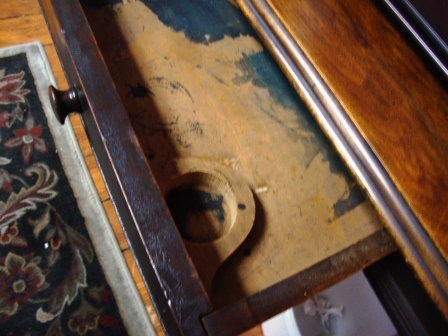 It was probably an inkwell when the desk was built. 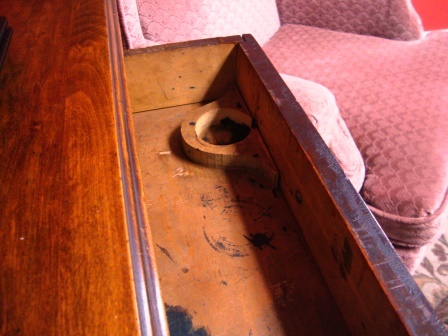 The writer’s bottle of ink would have settled into its home in the drawer to avoid spilling. Well, avoid spilling most of the time. I believe we have potential for finding all three of these in the basement. The basement, that is, that is still home to huge piles that Chuck made to allow the plumbers in last fall. Too bad I can’t just wave a wand and say “Accio Desk Chair!” In the meantime, I’ll move my muggle self to the piles and start sorting. My new home office awaits. This entry was posted in family life this old house and tagged Life is good., teachers live at school, thrift by Daisy. Bookmark the permalink. The little writing desk is perfect! Sweet desk! With a built-in organizer, too!